For quite some time now the TR7 has been used as a cheap(ish) entry into track-day events. Easy tuning, the availability of v8 transplants and of course the value of the Triumph TR7 has helped fuel the interest. 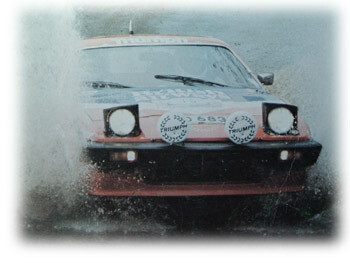 But more recently there is more and more interest in the TR7 as a rally car. Back in the days the little wedge was a competitive entrant - both in 2.0l 16v 'sprint' form and later as the hairy chested v8. Way back when there was Tony Pond, John Buffum and Per Eklund as the main luminaries but amongst other were Clark, Grainger and Dowson. Today there's a healthy historic rally scene and various other events which allows 'privateers' to enter in various classes - and some of these are pretty strict as to what is and isn't allowed with regard to modifications and originality. For now we'll look back at what happened but maybe in future we'll look at the current crop.... Smeets, Sawyer & Hall who all have rather special cars. And maybe I'll actually get to seeing these cars being driven rather than merely on show stands!! !